Made of heavy laminated cover stock, each chart has concise easy-to-read information that is presented in a clear, easy-to-understand format. Playing chords on the Dulcimer is a bit more involved than any other acoustic stringed instrument. The Basic Dulcimer Chord Chart published by Santorella Publications takes the guess work out of it. The five variation for tunings includes Standard Mixolydian Mode in the Key of D (DD-A-D / 1-5-1), Standard Aeolian Mode in D minor (CC-A-D / 7-5-1), Standard Ionian Mode in the Key of D (AA-A-D / 5-5-1), Standard Dorian Mode in D minor (GG-A-D / 3-5-1) & Standard Lydian Mode in the Key of C (DD-G-C / 9-5-1). In each of these tunings you will learn Major, Suspended, Fifth, Minor, Augmented, Diminished, Sixth, Dominant Seventh and Major Seventh Chords. Santorella’s Basic Dulcimer Chord Chart has a total of 120 chords with “fret board” diagrams indicating how to play each and every one of them. We have also included a Basic Chord Building Chart as an additional bonus. Not only do we show how to play each chord, but also how they are constructed. It’s hard to believe that all this information can be found in such a small package. 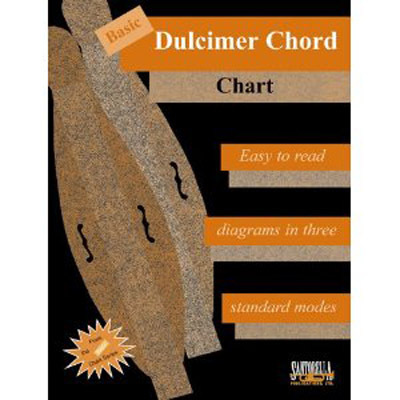 The Basic Dulcimer Chord Chart is not only portable and affordable, but perfect for those times when a glance is all you need.